(a) Install a new drum gasket onto the rear brake drum. (b) Install the rear brake drum. (a) Provisionally install the hub nuts. (b) Remove the hole plug, and turn the adjuster to expand the shoe until the drum locks. 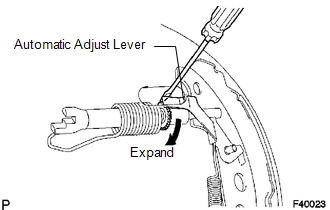 (c) Using a screwdriver, release the adjuster 15 notches.